One of the best and most durable canopy bags that you can use is a small grill cover available from Walmart for around $11. I put snaps in various locations on the bag to seal up the top and allow for compacting of the bag. An excellent line trimmer is available from campmor (www.campmor.com). 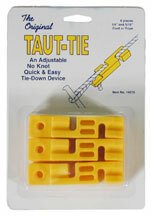 The product is called Taut-Tie and is used by campers to tighten tent lines up to 5/16 inch diameter. They cost about $4 for a three pack. They are very easy to use and are very durable.